Behind the poise and precision of quarterback Aaron Rodgers and the gutsy contributions of a host of role players, the Packers burnished their championship legacy with a memorable 31--25 victory over Pittsburgh in Super Bowl XLV. The football traveled only 26 yards through the air, beneath the high roof and hulking video screens at Cowboys Stadium on Sunday night in the closing minutes of Super Bowl XLV. Yet in truth it sailed across years. It left the right hand of Packers quarterback Aaron Rodgers at his own 18-yard line and was caught at the 44 by wide receiver Greg Jennings, who raced across midfield before being tackled. It was a killing completion that would push Green Bay to the brink of victory and the Steelers to the edge of desperation. But it was something larger, too, one big moment built on countless smaller ones. The Super Bowl is a cultural landmark steeped in excess that ends with confetti falling from the sky, yet its winners are lifetimes in the making. On this night the Packers had raced to an early lead before veteran defensive back Charles Woodson was knocked out of the game with a broken left collarbone just before halftime. Pittsburgh had rallied to within 28–25, and here on third-and-10, Rodgers called out Strong Left, Trips 27 Tampa. When Jennings slashed behind cornerback Ike Taylor and up the middle of the field, Rodgers hit him in dead stride. Six minutes later the Packers were in possession of a 31–25 victory and a fourth Super Bowl title, ensuring the Lombardi Trophy of a trip to its ancestral home. Long after the game was finished, Rodgers, who completed 24 of 39 passes for 304 yards and three touchdowns to earn the MVP award, walked across the celebratory locker room warbling a dreadful falsetto version of Usher's I Don't Know. (The 27-year-old quarterback had earlier joined with teammates to belt out We Are the Champions in the shower.) Now he fell into a corner cubicle, dressed himself while quaffing from a plastic bottle of grape soda (his favorite flavor) and connected a single play to a long wait. "That one throw was all about the last three years of my career," Rodgers said. Those would be the three years since he replaced Brett Favre as Green Bay's quarterback. Before that he sat three years behind the Packers legend, and long before that he was a skinny high school quarterback in Chico, Calif., who had to go to the local junior college to earn a shot at a football career. "The journey has been special," Rodgers said. "I'm not vindictive, but I'm blessed with a very good memory. You wait, you keep quiet and you take advantage of an opportunity when it comes." On this night he stood at midfield and accepted the MVP trophy while looking out at a couple of longtime Packers, wideout Donald Driver (another key player who was sidelined in the first half) and tackle Chad Clifton. When Rodgers stepped down he embraced his family, including his grandparents, Chuck and Barbara Pittman, 82 and 78, respectively, who'd driven to Dallas from California because they don't like to fly. In much the same way, for every player in green the game reached far beyond the field. More than 40 friends and family members joined Craig Rigsbee in the rec room of his home in Chico to watch the Super Bowl. It was nine years ago that Rigsbee, a 6' 5", 250-pound former college offensive lineman and the head coach at Butte College in Chico, walked through a neighbor's yard and recruited a player no one else wanted. It took some time to persuade Ed and Darla Rodgers to let their son, who scored 1310 on the SAT, attend a junior college, but Rodgers wanted to play college football, and Rigsbee helped him do it. One year after enrolling at Butte, Rodgers was at Cal, and two years later he was in the NFL, biding his time behind the seemingly indestructible Favre. Rigsbee and Rodgers talk all the time, even to this day. A couple of weeks before the Super Bowl, Rodgers wore a black BUTTE FOOTBALL hoodie for a television interview, then texted Rigsbee, "That was for you." Rigsbee watched Rodgers's laser shot to Jennings and remembered how Rodgers had lasted until the 24th pick of the 2005 draft in part because teams weren't sure he could make the big-arm throws. "I guess he can make those throws," Rigsbee said late Sunday night by cellphone. "When Jennings caught that ball, I'm telling you, we all just went crazy." There are always two Super Bowls. One is the spectacle that the public sees, and the other is the strategic battle that coaching staffs plan but do not discuss. This game was served up to the masses as a matchup of storied NFL franchises with nine Super Bowl victories between them, Pittsburgh with a record six and Green Bay with three, including Super Bowls I and II. A Steelers win would have given image-rehabbing quarterback Ben Roethlisberger a third ring (POINT AFTER, page 72), matching Tom Brady, and 38-year-old coach Mike Tomlin a second. For the Packers the payoff would be simpler: a return to greatness. 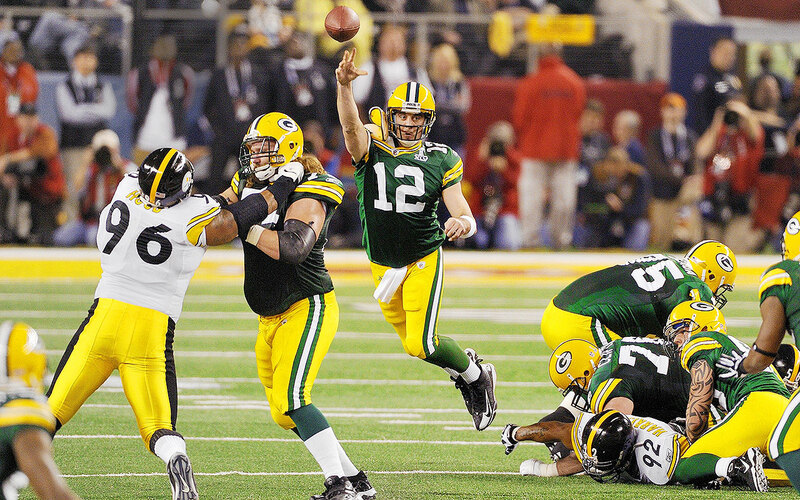 Both staffs examined the Steelers' 37–36 win over the Packers on Dec. 20, 2009, at Heinz Field. The teams combined for 973 yards in that game, but only 125 were on the ground. In the regular season this year, Pittsburgh's defense allowed only 62.8 rushing yards per game, the best in the NFL by nearly 30 yards. "They're not even going to try to run it this time," Steelers nosetackle Casey Hampton said four days before the game. "They know what happens when teams to try to run on us: They don't make any yards." Hampton was right. Green Bay had no intention of trying to win the Super Bowl by running, and Rodgers handed off just 11 times. But offense-savvy coach Mike McCarthy (whose Pittsburgh upbringing added yet another a layer to the game's intrigue) felt that Rodgers and the Pack's receivers could exploit the Steelers' secondary. Safety Troy Polamalu, the 2010 Defensive Player of the Year, was compromised by a nagging Achilles injury suffered late in the season, and that heaped more pressure on cornerbacks Taylor, Bryant McFadden and William Gay. "We felt we could spread it out four, five wide and use play action to beat them," Green Bay tight end Andrew Quarless said after the game. "We knew their corners were a little suspect when they were singling up." Rodgers's first completion was to Driver, the tough, 12-year-veteran possession specialist who was soon out of the game with a high-left-ankle sprain. At halftime the entire Packers receiving corps visited Driver in the trainer's room, where he told them, "I can't go." He heard a voice from the group: "We're going to win it for you." Jennings caught two touchdown passes, but the breakout star of the passing game was 6' 3", 217-pound third-year receiver Jordy Nelson. Although he had three of the Packers' numerous drops, Nelson made nine catches for 140 yards (both career highs), including the game's first touchdown and a 38-yard grab on a deep cross in the fourth quarter to set up Jennings's second TD. "It was all just opportunity," said Nelson, who blossomed into a major NFL prospect when he caught 122 passes as a senior at Kansas State in 2007; Green Bay took him in the second round in '08. His Wildcats quarterback, Josh Freeman, is now Tampa's promising starter. In the Super Bowl's aftermath Nelson walked through the catacombs of Cowboys Stadium holding his son, Royal, whose first birthday was three days before the game, and hugging his wife, Emily, whom he began dating when both were freshmen at Riley County High in Kansas, where the senior class had 65 students. Mike Nelson watched the Super Bowl from near the top of the upper deck of Cowboys Stadium. Three days earlier he had left with his family for the 500-mile trip from Leonardville, Kans., down to Dallas, a normally eight-hour drive that treacherous roads turned into a two-day, 11-hour odyssey that included an overnight stay in Norman, Okla. Mike and his younger brother, Jordy, grew up on a 3,000-acre farm, where their parents raised purebred Angus cattle. The boys played basketball on the concrete floor of a machine shed and tackle football in the snow. Mike was every bit the athlete Jordy was, "but then Jordy just kept getting bigger and faster," says Mike. In high school, where Mike was a year ahead, Jordy was a 6' 3", 200-pound shotgun option quarterback and a state class 3A champion in the 100, 200 and 400 meters, a dead flat burner. "I was so proud of my brother tonight," Mike said late Sunday night. "In high school he was just so intimidating, and then I'm watching him win the Super Bowl. It's amazing." Dom Capers has been coaching football for 38 years, with stops at 15 college and professional teams. Twice he took over an NFL expansion team, the Panthers from 1995 to '98 and the Texans from 2002 to '05. The Packers' defensive coordinator takes pride in the fact that he travels with crates of spiral notebooks full of schemes, which an assistant logs into a computer. It was Capers who would be charged with slowing a Steelers offense that had pounded the Jets for 166 rushing yards in the AFC Championship Game and that counts on Roethlisberger's playmaking when games are on the line. And it was the defense that gave Green Bay a 14–0 lead in Super Bowl XLV. Safety Nick Collins picked off a pass by Roethlisberger, who was under pressure from nosetackle Howard Green, and returned it 37 yards for a touchdown late in the first quarter. But Woodson, the 13-year veteran and inspirational leader of the Packers, and rookie nickelback Sam Shields were both injured just before halftime. Shields would return and play sparingly; Woodson spent the second half watching from the sideline, his arm in a sling. It was a huge loss, not only because Capers had transformed Woodson from a Hall of Fame--caliber cover corner into a blitzing, run-support inside defender ("It's been refreshing for me," Woodson said in mid-January) but also because it's Woodson's voice that the Packers players hear. He was the last man to talk to the team before the Super Bowl, ditching a long-planned speech he'd written when Lloyd Carr, his coach at Michigan, texted him and said, "Remember, just win." That is what he told the Packers before the biggest game of their lives. Just win. "It was pretty emotional," said kicker Mason Crosby. It was even more emotional when Woodson spoke to the team at halftime, knowing he was finished for the night. "Charles said, 'You don't know how bad I want this,' " said fourth-year linebacker Desmond Bishop. "That was all he got out. Then he got choked up. It was tough." So were the Steelers after the break—Pittsburgh scored on its first drive of the third quarter, and a game that had had the makings of a blowout was suddenly 21–17. But on the first play of the final quarter, with Green Bay still clinging to a four-point lead, defensive tackle Ryan Pickett and All-Pro linebacker Clay Matthews sandwiched running back Rashard Mendenhall, Matthews forcing a fumble that the Packers recovered. On the ensuing possession Rodgers hit Jennings for an eight-yard touchdown pass. And in the final two minutes, with the Packers leading 31–25 and Roethlisberger seemingly poised to reprise his Super Bowl--winning drive from two years earlier against Arizona, Green Bay forced three straight incompletions to seal the victory. The Picketts were sitting in the lower bowl of the stadium, five strong—five and a half, really—watching 6' 2", 340-pound Ryan trying to win a Super Bowl in his 10th NFL season. There was his wife, Jennifer; daughters Esther, 6; Abigail, 5; and Lydia, 2; and son Ryan Jr., 3. Jennifer is also five months pregnant with the couple's fifth child. Ryan Sr. is not just a football player but also a husband, a father and the glue that binds his young family. "This pregnancy has been really hard on me," said Jennifer. "When Ryan comes home from work, he makes dinner, reads to the kids, puts them to bed. When he left for Dallas, I just cried, because even though he was going to the Super Bowl, it's hard to be apart." They met in late 2001, when Ryan was a rookie with the Rams, fresh out of Ohio State, and Jennifer was working at the Gap in an Atlanta mall. Ryan's brother goaded him into asking her for a date, and not long after, she was in the stands when St. Louis lost to the Patriots in Super Bowl XXXVI. "Every year we were optimistic we would go back," Jennifer said. They found each other on the field on Sunday night, Ryan sweaty and exhausted, Jennifer in her number 79 jersey with MRS. PICKETT on the back. All the kids were there, too. "We hugged for so long," said Jennifer. "I just didn't think we were ever going to stop holding each other." There are teams that evoke something beyond merely winning and losing. Celtics. Yankees. Notre Dame. The Packers are such a team. The aura began with Curly Lambeau, who founded the Pack in 1919, coached until 1949 and won six NFL titles, and grew stronger with Vince Lombardi, whose teams won five more championships and who is the only NFL coach to be the subject of a Broadway play. The Packers are also the only community-owned franchise in the NFL, a status that deepens the relationship between town and team. "It's something you can really feel," says Clifton, an 11-year veteran. "These are the greatest fans in the world." Yet it was unremarkable for many years after the departure of Lombardi; from 1968 to '91 the Packers had just five winning seasons. In 1992 the team's board hired Ron Wolf as general manager, and Wolf hired then 38-year-old Ted Thompson to join his staff. Wolf presided over the Super Bowl XXXI victory and the Super Bowl XXXII defeat before retiring in 2001. Thompson, who'd gone to Seattle in 2000 to join former Packers coach Mike Holmgren, returned to Green Bay in 2005 as Packers general manager. "Ted has been a very steady guy," says retired Packers president Bob Harlan, who brought Thompson back and was in the middle of the celebration on Sunday night. "He left here and built a Super Bowl team for Mike Holmgren in Seattle. He's right for this franchise. He doesn't want to sign an expensive free agent in May and then have him sitting on the bench in October." The most critical decision of Thompson's tenure came when he severed ties with Favre in 2008 by trading him to the Jets during training camp. It came three years after Thompson had drafted Rodgers, and it has led to what Hall of Famer Steve Young, who succeeded Joe Montana in San Francisco, says will be "the next back-to-back Hall of Fame quarterbacks." But in this championship season Thompson was tested in other ways. The Packers were primed for a title run but suffered an endless succession of injuries, with 15 players landing on injured reserve. Each day Thompson would pluck names from the eight-by-four-foot "emergency board" in the team complex. In mid-January, Thompson said, "It's a pretty sorry-looking emergency board right now." Among his most prescient moves was drafting University of Buffalo running back James Starks in the sixth round in 2010, even though Starks had missed his entire 2009 season with a shoulder injury. Starks didn't play an NFL game until December but led the Packers with 315 yards in four postseason games and rushed 11 times for 52 yards in the Super Bowl. Sanquin Starks looked around the field when the Super Bowl ended, and good Lord, it almost wasn't real. The Packers had won, and there was his little brother in the middle of it all. They were two of seven siblings who grew up together in Niagara Falls, N.Y., and James was always a terrific football player. When he hurt his shoulder and couldn't play his senior year at Buffalo, Sanquin, who'd moved in with him, helped with the pain and the training. "To have football taken away in the most important season of your life," says Sanquin, "that's tough. But it was good for us. That's how we became so close. We're not just brothers. We're best friends." Now the confetti was falling, and Sanquin was taking in the scene and trying to keep the moment in his heart. "To see something like that," he said, "you're never going to forget that. It's a life-changing thing. I get chills just thinking about it. It's unbelievable. It's the most unbelievable thing ever." The locker room is nearly empty. Equipment managers pushing large green carts pick up discarded clothing. Workers rip Super Bowl XLV banners from the walls, exposing Cowboys logos. Woodson is the last to finish, dressing himself with one hand—pulling up a sock, contorting himself into an undershirt, grimacing. "I'm a man," he says. "I gotta do this all myself." But if there is a larger lesson here, in this room littered with tape and confetti, smelling of sweat and still ringing with the noise of victory, it is this: Nobody does it alone.